Although a trip to Florida is supposed to be about rest and relaxation, there’s no such thing as a day off for Dr. Temperance Brennan. She has come to visit her friend, a dedicated ornithologist who’s researching the threat that intrusive Burmese pythons pose to indigenous bird species in the Everglades. While sorting through the stomach of an eighteen-foot specimen, they make a disturbing discovery: bones that are unmistakably human. Welcome to installment 16.5 of the Tempe Brennan series and Reich's second novella. 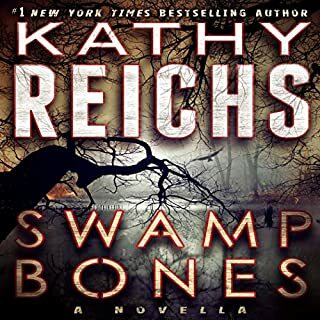 In Swamp Bones, Forensic Anthropologist Tempe Brennan heads to the Florida Everglades where she meets up with her Ornithologist friend Dr. Lisa Robbins. Invariably work seems to follow Tempe so it is not surprising when human remains are recovered from the belly of a python. 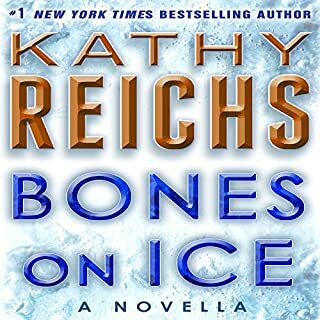 Having read many of the Tempe books - including the Bones on Ice novella - I thought I would pick up a copy from Audible as it was inexpensive. After listening to the book I can state that while this was a satisfactory story I felt that the writing wasn't up to Reich's usual snuff. I felt that the plot itself was set-up for a full-length book, yet it was condensed into a 98 page novella/3 hour audio book; it lost some finesse along the way. Nevertheless, I still appreciated this novella. As usual I felt that I walked away from this story having learned a few new tidbits of information. In this case, readers learned a bit about Pythons and the Everglades. Ultimately, its purpose was served which was to whet the appetite for the next full-length novel. Moreover, this short story was great in the sense that it provided a quick and entertaining read/listen for a 'one-afternoon' reading session. I would likely recommend this book to fans of the series. However, one must be aware that this is a novella; henceforth the quality is not the same as the novels. It is called the "death zone": the point on Everest, nearly five miles high, above which a climber cannot be rescued. More than 250 souls have lost their lives there. Most of the bodies remain, abandoned, frozen in place. When an earthquake leads to a miraculous recovery, Dr. Temperance Brennan is hired to identify a frozen, mummified human corpse. The victim is the daughter of a wealthy Charlotte couple who never got the chance to say goodbye. But far from offering solace and closure, Tempe's findings only provoke more questions. I have come to love Kathy Reich’s novellas; each one is a brilliant appetizer between major releases. “Bones on Ice” was no exception. When Tempe Brennan is called in during the weekend to assist on a body identification for the late daughter of a well to do family, she is unaware of the can of worms she is about to open. Tempe's boss is adamant that this case would be straight forward; yet it is turning out to be anything but. Is this really a simple case of death by exposure on Mount Everest? Or is Brighton Hallis a victim of an ice cold murder? I thoroughly enjoyed this book. In many cases I worry about authors bringing out novellas between books. A lot of times novellas lack an authors’ usual quality however in this case, this was not a problem. As with many of Reichs' books, I learned a lot during the course of the plot and I liked the fact that I came out of the book knowing a bit about the culture and terminology of mountain climbing as well as the detrimental biological effects of the extreme climate on the human body. All-in-all, it made for a gripping and informing read; or in the case of audio book, listen. In regards to the audio version, I found the narrator pleasant enough to listen to; I do not have any complaints about the voice. It was a nice, short audio book that was perfect for a 'one evening sit' listen. That being said, if I MUST state a complaint with this novella, it would be that I felt certain scenes were rushed. Some of the conclusions seemed a touch contrived but this was not a major issue; I just wish that 100 or so pages could have been added in order to fill out the story. In conclusion, if you are a fan of the Tempe Brennan Series I would not hesitate in recommending you read this competent addition. I look forward to reading the next book in the series, "Speaking in Bones." I have been in a reading dry spell lately. So, a fluffy romance was just what I needed. 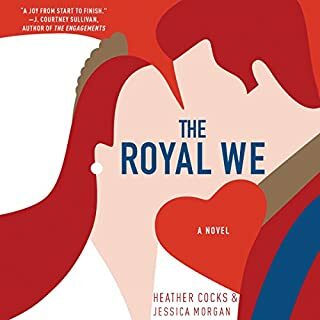 The Royal We was a perfect choice; I had been eyeing the book on audible for awhile, and I finally decided to give it a try. I found that the Royal We captured my attention at the beginning of the story and held on until the end. I had a difficult time putting the book down at night. The plot to this book a blatantly obvious parallel to Will and Kate. The plot to this book is a blatantly obvious parallel to Will and Kate; which, as a Royal Family enthusiast, I found wonderfully charming to read. The characters were quirky, and appealing to the reader. My only complaint with the characters is that I found Bex's twin to be irritating and narcissistic. However, it was not enough of an issue to ruin the book. Additionally, I believe that Christine Lakin did an excellent job narrating the story. I would listen to more books narrated by her. Overall, this was a cute story that didn't have a deep or complex plot; perfect for summer. I would, without a doubt, recommend this book to anyone who is looking for a fluffy, fairytale romance. 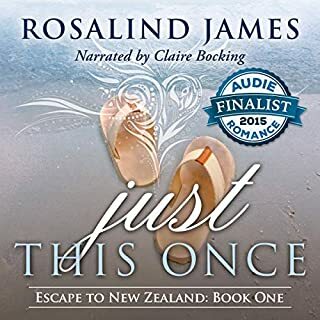 Set in the sleepy, seaside town of White Cliff Bay, Summer at Rose Island introduces readers to Darcy Davenport; who has moved from London to escape her suffocating parents. No sooner has she arrived, she has a seemingly abrupt meeting with the mysterious American, Riley Eddison, who lives in the local lighthouse; which, is revealed to be marked for demolition. With her position in community development, can Darcy assist in uniting the citizens of Rose Island to help save the lighthouse? Or will she go back to London, once again a failure in her parents' eyes? 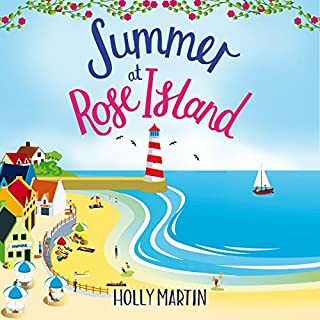 Despite being the third book in the White Cliff Bay series, Summer at Rose Island is my first introduction to Holly Martin’s writing, and I was pleasantly satisfied with the experience. I mean, this book was corny, but a good corny. 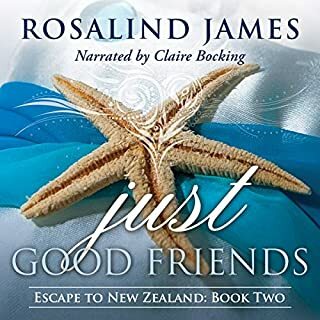 I loved getting cosy in bed and visiting Darcy and Riley through the audio narration. While the story has a relatively predictable plot, there was something incredibly sweet about each one of Holly Martin's characters; I fell in love with Rose Island immediately. However, there were a few points where I became frustrated with one, or both, of the main characters as I felt that they were digging their heels into a feud a little too much. 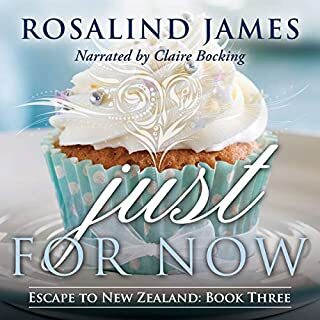 Overall, though, I truly enjoyed listening to this book; I felt that the author did an outstanding job of drawing the reader into Rose Island through her words. Now, it is time to go onto Audible and download the rest of the series; I need more fluffy listening as the weather gets progressively colder.